If you have made it through the two conflicting poems, congratulations! They have opposite messages-which one is right? I think John Donne's. 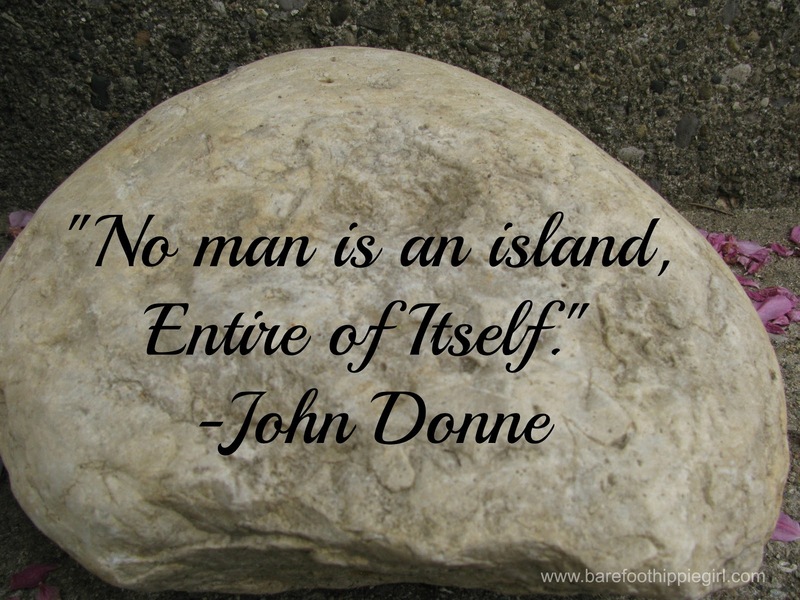 "No man is an island, entire of itself." We may try to build the walls and armor of S&G, in order to protect ourselves. But, we aren't rocks and islands. We do feel pain. We do cry. And we aren't entire of ourselves. We need God. We need people. If we didn't, this would be a world of hermits who died out years ago. A few weeks ago, I was reading Exodus 17-18 for my daily devotions. I was struck by the story of Joshua and the Israelite army fighting the Amalekites while Moses sat on the top of a hill overlooking the battle scene. Moses held up his hands and prayed for their army to be victorious. But, have you ever held up your hands over your head? It doesn't last very long, does it? Your arms get tired. The blood flows out. It is too hard to keep them up. The same thing happened with Moses. His arms started getting tired, so he put them down. But, then the Amalekites started winning. He put his arms up in the air, and the Israelites prevailed once again. Aaron and Hur, Moses' brother and uncle respectively, saw the problem. They sat Moses down on a boulder, and held his hands up for him. The entire day, until the sun set. My, how all three must have been tired! But Israel was victorious! Their way was clear to the Promised Land. It took teamwork-Moses, Aaron, Hur, Joshua and the army, all doing their part. Next chapter...Moses is refereeing disputes among this nation of over 1 million people. Someone looks at you cross-eyed, take it to Moses. He will get you justice. We all need community. We need to have a support system in place to rely on and to help us day in and day out. That is the idea of village. Furthermore, whenever we are attempting to serve the Lord, a support system is not a luxury, it is crucial. We need people to bear the burden with us. And we need to be bearing other's burdens with them. Christian work is not for lone rangers. (btw, the Lone Ranger had Tonto, so he wasn't that lone. I can't wait to see the new movie) The only work that was a solitary work was Jesus Christ's redemptive work on the cross. There was no one to help Him. He was even forsaken by God. It is not that way with Christians and service today. We are called to work together to move forward the gospel and God's kingdom. We have to hold up each other's hands in ministry. We have to help bear the burden. We have to embrace the idea that we are not an island, entire to ourselves. We need to come alongside our pastors, and missionaries, elders and deacons, Sunday school teachers and Bible study leaders. Our young parents and our young people. Our grey constituency. Everyone. Because most, if not all, Christians are attempting to serve God in some way or another. 1) Pray. Anyone can pray. We can each walk a brother or sister before the throne of grace. God delights to answer the prayers of His people. 2) Give. Financially. Materially. Maybe someone needs money. Maybe they need a meal. Maybe they need a note or an email. Maybe you have the means to tangibly strengthen their hands. 3) Be there. Aaron and Hur didn't hold up Moses' hands from 300 miles away. They were right next to him. Be there to do projects or study the Bible together. Visit your missionaries. Let all these people know they are not forgotten. You do see and you do care. I need you all to pray for me. Pray for peace, and multiplied time. Pray that I remember what I need to. Pray for flexibility. Pray for strength. Pray for eternal fruit. How can I help bear your burden this week?